Dr Josh Nelson is a Golf-specific Sports Chiropractor that specialises in the assessment, treatment, prevention, and performance for golfers of all levels and ages. 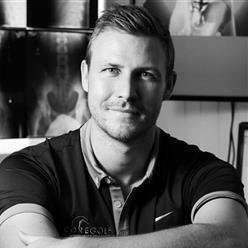 He holds a Bachelor of Chiropractic Science degree and Masters of Chiropractic from Macquarie University, along with being certified as an Internationally Certified Chiropractic Sports Physician (ICCSP). He is currently the only Sports Chiropractor in Australia to be certified as a Level 3 Medical Professional with TPI. Josh utilises a combination of functional movement assessments, manual therapies and functional exercises in order to get the best out of his Golfers from the amateur player through to the elite touring professional. It is Josh's personal belief that every golfer deserves to be able to play the game they love as long as they want to at their optimal ability. He achieves this for his clients by working closely with their support network (predominantly their Golf Coach) to create the best learning environment possible whilst decreasing their chance of injury and enhancing their overall performance.